Creativity – one might think that you are either born with that talent, or not. But thought leaders disagree. They say creativity can be cultivated. Current definitions of creativity emphasize the ability to see things from different perspectives, ask questions, and solve problems. Experimenting, failing, and learning from failure are essential aspects of creative thinking. Fostering young children’s natural curiosity, imagination and playfulness is the focus of Fairfax Futures’ 14th Annual School Readiness Symposium, where Dr. Rebecca Isbell will be the featured speaker. Isbell is the co-author of Nurturing Creativity: An Essential Mindset for Young Children’s Learning. Read an excerpt here. 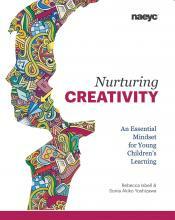 Learn more or read an excerpt from Nurturing Creativity: An Essential Mindset for Young Children's Learning.